I'm a writer from Los Angeles. The pace of life in the current age continues to speed up while technology and the economy make it look like we are just getting started. In an age where life feels too fast to keep up, there is a strong temptation to speed up anything that we can with shortcuts and streamlined systems focused more on efficiency than on people. The International Slow Food Movement is an effort to preserve traditional food preparation, promoting communal enjoyment and protecting local food producers. 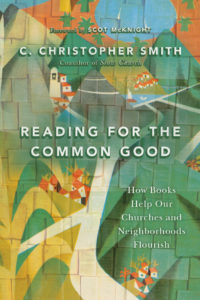 Authors Christopher Smith and John Pattison use slow food as a metaphor to help us reimagine what it means to live together as communities in churches that are rooted to a particular time and place. 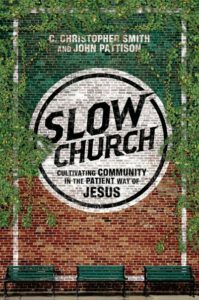 Slow churches resist the “cult of speed” that drives us to fill our churches as quickly as possible with people just like us, focusing instead on “…cultivating a deep, holistic discipleship that touches every aspect of our lives.” (14) This contrasts with a more fast-food-like approach that aims at efficiency, values predictability, measures by quantifiable results and seeks to retain control of God’s works in the church. A seismic shift has shaken the Western world in recent decades, pushing Christianity and the church out of the center of society and into the margins. The era often referred to as Christendom featured the religious arm of the church and the secular arm of the state cooperating to build a Christian civilization. The collapse of this long-standing arrangement raises profound implications for the life and ministry of the church. The demise of Christendom presents an opportunity to interpret Scripture from a perspective that is less hindered by privilege and more consistent with the context of the Bible’s original audience. 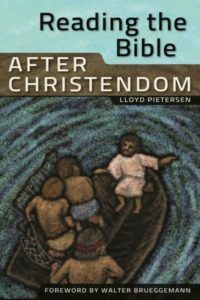 Pietersen lays out his case for this fresh look at how we read the Bible in three parts.